Growing your business is the primary goal. How to accomplish this goal is where the challenge comes in. Visual Visitor can help you accomplish this by arming your Sales and Marketing teams with the tools they need to stay ahead in today’s online world. How many sales have slipped away because your team did not have the tools to identify those anonymous website visitors that showed real interest in your product? Or, how many prospects did you miss because by the time your business was aware of their interest, they had already been wooed by a competitor’s pitch? As most buyers start their journey in looking for a new service or product – referred to as the Buyer’s Journey -, they are usually only aware of the top two to three names in the business and they are unlikely to even be fully aware of their need for your product or service. Now imagine that those potential customers are busy checking out your website…and the websites of your competitors. You’ve done your job and created wonderful content that fully describes your business, what you do, and described your product(s) so that those visiting can fully grasp the concept of you. Is it enough? What if you could proactively sell to those prospects before they shopped around? Who is visiting your website? What are they looking for? Where are they coming from? These are not just high level questions… They are the questions that your sales staff and marketing team are looking to answer. Since, as most sales people already know, coming into the game after a prospect has begun their research phase lowers their chances of converting that prospect to a customer, getting in early is paramount. With the many tools and features of the Visual Visitor product, we arm your team to win those prospects. 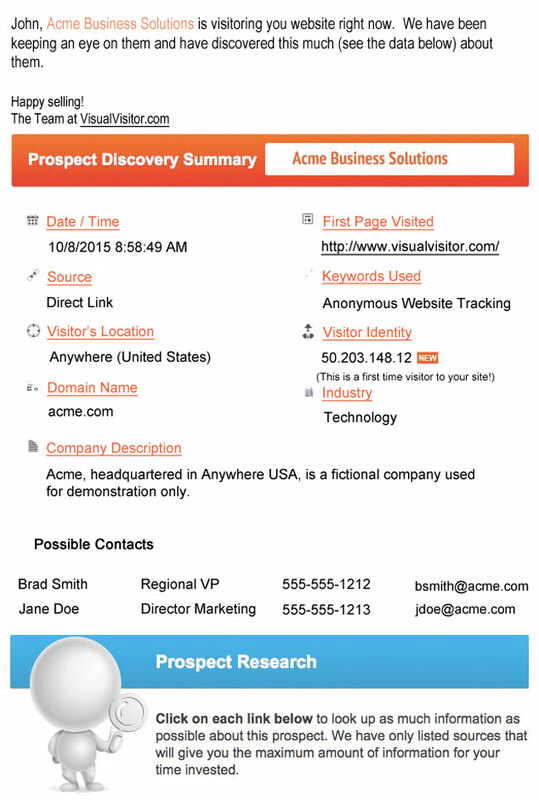 As prospects visit your website, Visual Visitor is standing by. We automatically email you an Instant Alert as they are on your site. This email will list out the visitor information, pages viewed, the time on page, the referrer, and more. Now you not only know that this prospect was on your site, you also know what they were looking at and their interest level in each product/service. You now have the tools to introduce your business to the prospect early on before the prospect introduces themselves. Let’s face it, if as a sales person we wait until a prospect approaches us, we are already way behind. Our prospect is now in charge of what they think that you offer, what they think that they need, and has probably already been wooed by the competition. That really hurts the sales pipeline and our chances of closing a profitable deal. Visual Visitor gives you the power to change that narrative. Now you can reach out to that prospect while they are just starting to do their research. You can correctly establish their need for your product or service and put the competition in the position to compete on features and price. Along with Visual Visitor’s Instant Email Alerts, we also have our Email Campaign Integration tool, Form Integration, Analytics, Reporting, Zapier Integration, and new features on the horizon. These tools are all a part of the Visual Visitor package and complement each other creating a suite of sales and marketing tools that are both powerful and affordable.